PurePro M800 system is a modern kitchen appliance that has been carefully designed with health consciousness, efficiency, high performance and convenience in mind. PurePro M800 are the world's most elegant water filter systems. 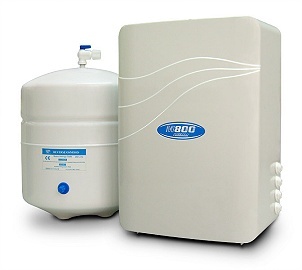 PurePro M800 system uses reverse osmosis (RO) technology - which is recognized as the most effective at significantly reducing a large number of contaminants that may be in your water - no other home water treatment system offers you as much protection and reliability. A very compact solution that efficiently combines reverse osmosis (RO) technology with four inline cartridge filters to produce high quality pure water. PurePro M800 system is available to be installed the booster pump for low water pressure needs. Upgrade 6th stage to have the UV sterilizer or mineral filters are also available for PurePro M800 system. Use inline filter cartridge design makes filter changes fast, clean and easy. No tools required for replacements. The stylish design of the PurePro M800 system was created to fit elegantly in any kitchen environment. The clean lines and graceful contours of the bright white cabinet make it the most attractive reverse osmosis water system available. PurePro M800 system use quick-fitting connector design makes installation fast and easy. Complete 5 stage reverse osmosis water filter system. Easy-open lid for easily cartridge filters replaced. Use inline filter design makes filter changes fast, clean and easy. Flow Restrictor, Stainless Steel Check Valve. Feed water connector, deliver valve & Drain Saddle Valve. Quick-connect fitting for easy installation. -Input in AC 110Volt, 220Volt or 240Volt (50/60Hz).